Paul McCartney enjoys a mini Beatles reunion at daughter Stella's event in LA . Beatles Radio: The Beatles, Solos, Covers, Birthdays, News The Fab 4 and More! They make up one half of one of the most renowned pop groups of all time. 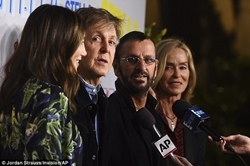 And it was just like all times when Paul McCartney and Ringo Starr were reunited on the red carpet of Paul's daughter Stella's latest fashion event, in Los Angeles. The iconic musicians were seen sharing a catch up and speaking to press as they attended the event. Paul, 75, and Ringo, 77, chatted to one another like the old pals that they are with their respective wives on their arms. Nancy Shevell joined husband Paul in a tropical leaf print dress, while Barbara Bach stood beside spouse Ringo in a sleek black ensemble. Nancy, 58, married the rocker in 2011, three years after his divorce from Heather Mills. She is his third wife - his first, Linda, died in 1998 from breast cancer. She was the mother to Stella and other siblings Mary, Heather and James. Barbara, 71, married Ringo in 1981 - she is his second wife, having divorced from Maureen Starkey Tigrett in 1975. Paul and Ringo are the remaining Beatles stars - having lost George Harrison to lung cancer in 2001 and John Lennon prior to that in 1980. John was murdered in New York by gunman Mark David Chapman.